I’m Sue Jalowiec, a long-time hand and machine knitter (and seamstress). 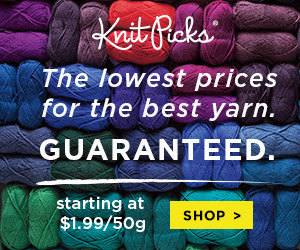 I purchased Bonnie Triola Yarns when she retired a number of years ago. In 2010, I was complaining to my friend and co-worker, Matthew Friedman (a programmer) that I was frustrated with writing knitting patterns by hand (I’m not a math person). I would do all the math for a design based on a yarn I had for sale, then I’d sell out and the yarn was no longer available. Of course, the pattern was no longer valid unless I could match the exact gauge. “It’s only Math”….. Matt and I started working on our pattern “engine” shortly after. This allowed me to come up with a design and allow knitters to use any yarn and any knitting machine … even hand knitting. The website grew to include our Basics Blueprints, Video Instruction (our Learning Library), Machine Knitting Courses, Stitch Patterns, Knitters Math Tools, etc… we grew and grew and grew …. What can Knit it Now Do for YOU? Today we offer so much! The Learning Library has easily searchable videos, tutorials grouped into series by topic. Our Machine Knitting Courses tackle individual topics in an interactive, step-by-step format, helping you learn and master new skills. We still offer yarn on cones. Sadly, the availability of yarn on cones has diminished so much over the years, we are pleased to be able to offer yarn from Jaggerspun (US), Tamm (Mexico), and we are the US distributor for Yeoman Yarns (UK). In addition we offer a wide range of both printed books and downloadable eBooks for machine knitters. Our dynamic “Basics” Blueprints are the heart of our Knit section. Take a basic shape, knit it with any yarn on any machine … with any stitch pattern and make it your own! We also have some “vintage” pattern available that are inspirational in style and techniques. Part of our “Knit” section are Projects. These are designed as quick knitting projects that you can make in a weekend. They often focus on a single technique allowing you to try the technique before committing to an entire garment. Don’t just knit swatches, we encourage you to “play” with a finished item. Did I mention our Knitter’s Math Tools? Let us do the math for you! In looking back, I’m always amazed at how much we have accomplished in the last 7+ years. A knitter and a non-knitting programmer … who knew? I just love your website. I’ve been a member for a number of years now. I am from New Zealand and we have a wonderful NZ wide Society for machine knitters here but as the age of the members increases, natural attrition has seen a drastic decline in member numbers in the areas right around the country. 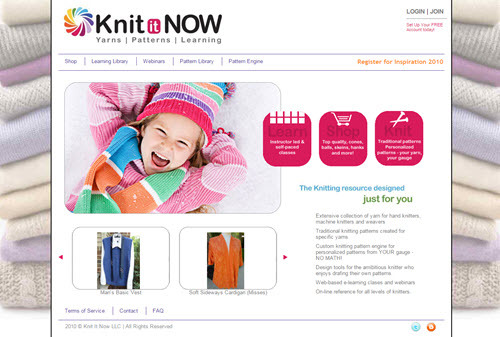 My Whangarei branch has long since closed and I find it invaluable to still be able to connect with knitters through your Knit it Now website. My only bug bear is that – because you are American based – I find it frustrating to try to convert your use of the American yardage and pounds etc into the metric system and terminology. For instance, buying yarn leaves me frustrated trying to work out if the yarn is on a 500gm or a 1kg cone. I have a request which I hope may also help other members who use the metric system. Is it possible to have a window on your site that opens to a converting calculator or something similar that will quickly and easily do the conversions for us. Many thanks and keep up the wonderful site. When we first started Knit it Now, we didn’t consider that we would have a worldwide reach and didn’t even add cm dimensions to our patterns … we’ll look into making the cone weights more clear. Great – I am also in New Zealand and find this site very valuable – a bit of a lifeline actually! So all help with metric quantities gratefully accepted! Hi Katharine in New Zealand! When Matt and I started we didn’t consider having a worldwide audience (duh …) We quickly added metrics to our patterns, tools and website. I try to keep cm in mind when writing. Please let me know if I miss something or if there is something major we’ve missed. Although we demo on Japanese machines, from basic machines to punchcards to electronics, much of what we teach DOES apply to your USM. Many of our subscribers use that machine. The concepts are the same. you have a flatbed of needles, you pass the carriage across and form stitches. Shaping (increasing and decreasing, binding off, casting on, reading patterns, creating stitch patterns, etc) …. are all the same. We try to keep our instruction as “generic” as possible. Now that you’ve had a chance to take a look at what we have to offer, do you see value for you? Coming up next week is a workshop for basic socks … yes, you can knit socks on your USM. Please let me know if you have any questions and if there is anything I can do to help you on your journey to master your knitting machine. Hello Sue – I now have two knitting machines, and I’m still learning. In fact, I helped a friend get started on her LK100 just a couple of days ago. I have a question – will the LK150 carriage work on an LK100 needle bed? I’d love to try it out. Anita, I’m not sure about the 2 carriages … anyone have the answer for her?